Rome needed workers to maintain its wealth. The Romans may have welcomed the first people they conquered as citizens, but after 265BCE, the Romans began enslaving many of their captives. Slave labor created many of the great architectural achievements of ancient Rome. A slave revolt led by Spartacus threatened the stability of the Roman Republic. Spartacus was likely from Thrace, a land northeast of Greece, but we don’t know much about his early life. Spartacus’ later success on the battlefield suggests that he had military training, but by 73BCE, Spartacus was condemned to slavery and forced to train as a gladiator. In ancient Rome, most gladiators were slaves or criminals who went to battle with other slaves or wild animals for the entertainment of the Roman people. Spartacus and a group of other gladiators escaped captivity by seizing kitchen knives from the captors and fighting their way to freedom. The Romans sent a small force to capture the escaped gladiators, but the slaves killed most of the Roman soldiers and took their weapons. The escaped slaves plundered farms and villages throughout the Italian countryside for more than two years. They liberated other slaves as they went and recruited them to join their growing revolt. The Roman army believed they cornered the escaped slaves on Mount Vesuvius by blocking the only path from the mountain. Spartacus and his fighters secretly climbed down a steep cliff using vines as ropes. The slave army then attacked the unprepared Romans from behind, killing most of them. The army of slaves became folk heroes for many of the poorest people of ancient Rome. Folk heroes are popular with common people, but always not with people in power. As word of their success grew as many as 120,000 of the poorest people of Rome joined the revolt. The slave revolt ended after a bloody series of battles near the southern tip of the Italian peninsula in 71BCE. Two Roman generals, Crassus and Pompey, led a force of 40,000 soldiers. The slaves were no match for the superior weapons of the Roman armies. Spartacus was killed in action, but the Romans took six thousand of his rebels prisoner and crucified the men. Crucifixion is a form of execution where the prisoner is nailed to a cross and left to die a slow, painful death. The Romans placed the crosses along the Apian Way, one of Rome’s most traveled roads. The sight of the crucified slaves served as a gruesome reminder of the strength and the brutality of the Roman army. The victorious generals Crassus and Pompey returned to Rome as heroes. The Senate selected both men to be consuls, but they were soon to come into contact with the greatest general in Roman history: Julius Caesar. 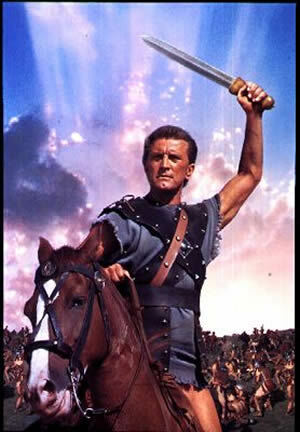 Kirk Douglas starred in the title role of Spartacus (1960). 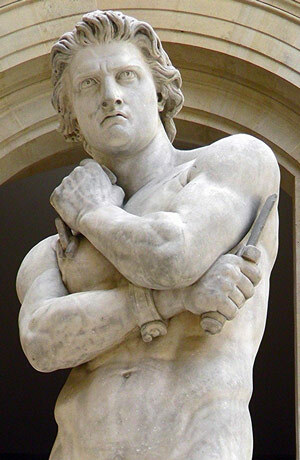 This larger than life marble statue of Spartacus breaking his chains was sculpted by Denis Foyatier in 1830.